Kevin Ashton coined the phrase “The Internet of Things” back in 1999, but a decade later most of the on-line gadgets in my house are still recognisable as being technology. My fridge is still a fridge, my front door still needs a key and my house doesn’t talk to me. 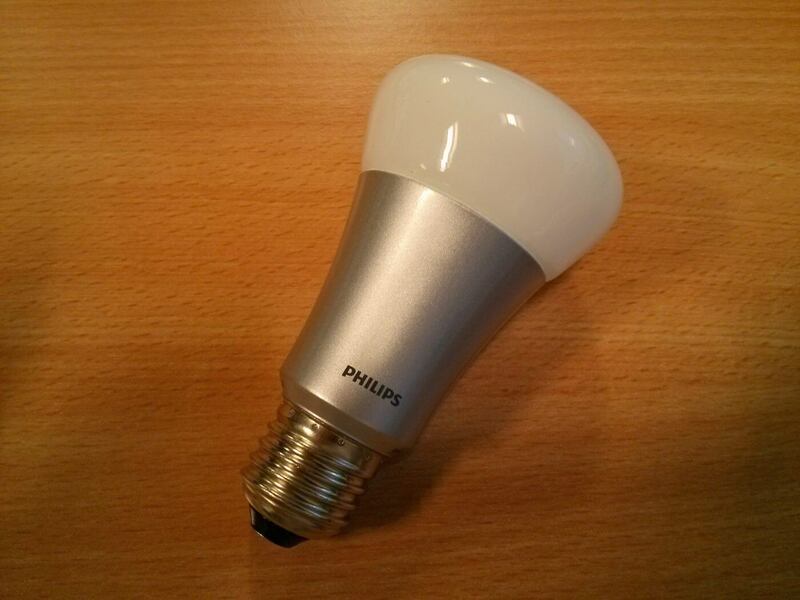 That was the situation until a couple of weeks when I received a Philips Hue “Personal Wireless Lighting” kit which lets me control the colour of light bulbs from my smartphone, both in the house and from outside across the internet. That’s the Internet of Things. I can imagine that a number of GNC readers are going, “Huh? Why would I want to control the colour of my lightbulbs from my smartphone?” Until you see in action, you can’t believe how much fun and how cool it really is. Not only can you turn your house lights on as you drive up the road, you can co-ordinate the lighting with your mood or your decor. Want a Christmassy green and red? Not a problem. We’ll see exactly how it works a little later on. 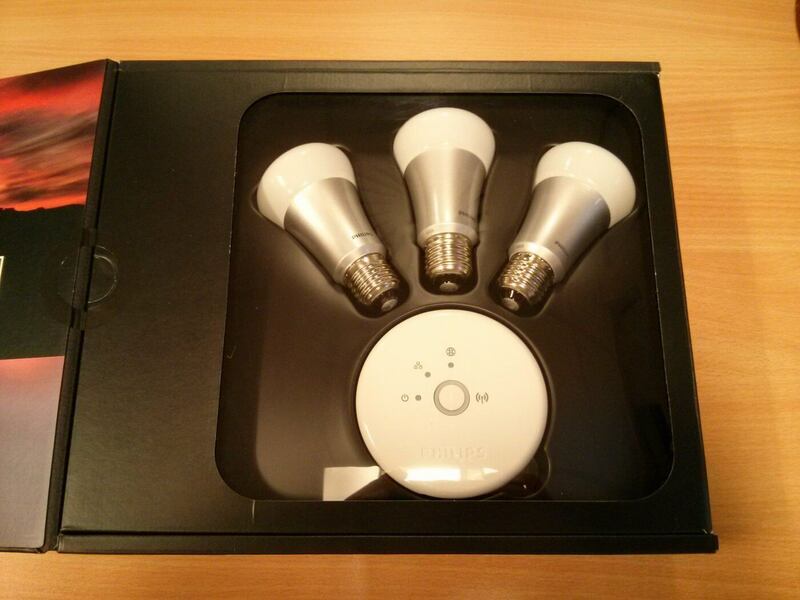 So let’s take a quick look at what’s in the box of Philips Hue in more detail. Opening it up reveals two of the three main components, the wireless bridge and the bulbs themselves. 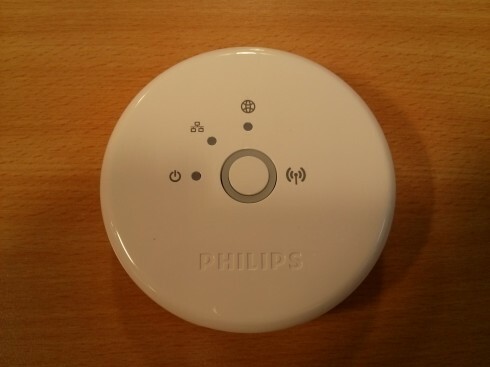 The bridge connects to your network via an ethernet cable and communicates with the light bulbs using Zigbee. The bulbs are standard ES bulbs and there are GU10 and GR30 (SES) variants available as well. There doesn’t seem to be any bayonet cap versions (BC) so if you only have BC light fittings you might have to get some converters. Setting up the system is very easy. Screw the bulbs into the lights. Connect the Hue bridge to the network with the ethernet cable and plug in the power adaptor. 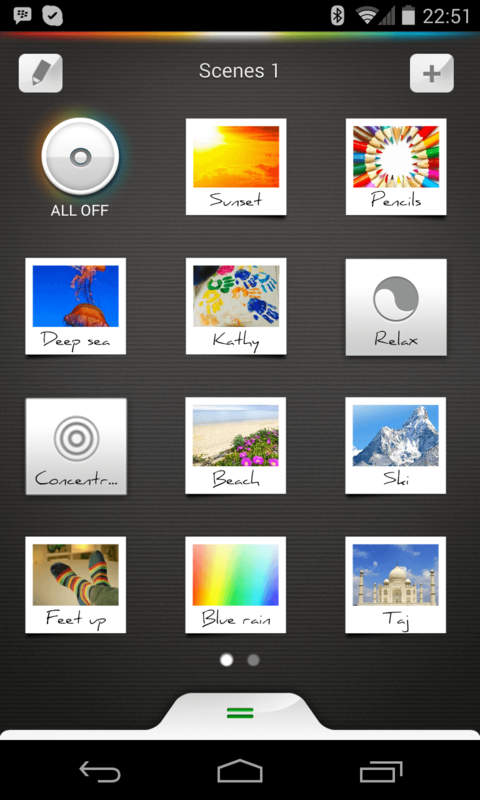 Load the Hue app onto your Android or iOS smartphone or tablet. Job done. It’s that straightforward. The first time the app runs, it looks for the Hue bridge on the network and once it’s found, you authorise the app to access Hue by pressing the button in the middle of the bridge. 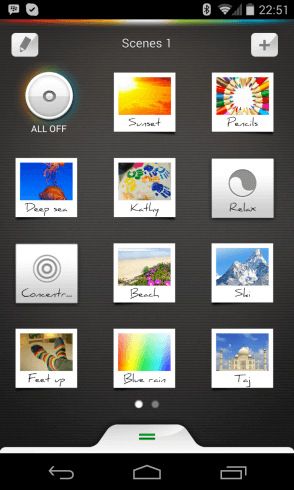 It’s a layer of security that stops unauthorised people or apps from accessing the Hue. The Hue app lets you control all the lights connected to your bridge mainly via “scenes” which act as presets for each light’s colour settings. Here’s the main screen. Each mini photograph is a preset for a number of lights and it can be just one or all three. Typically the settings are based on colours picked out from the picture associated with the scene. 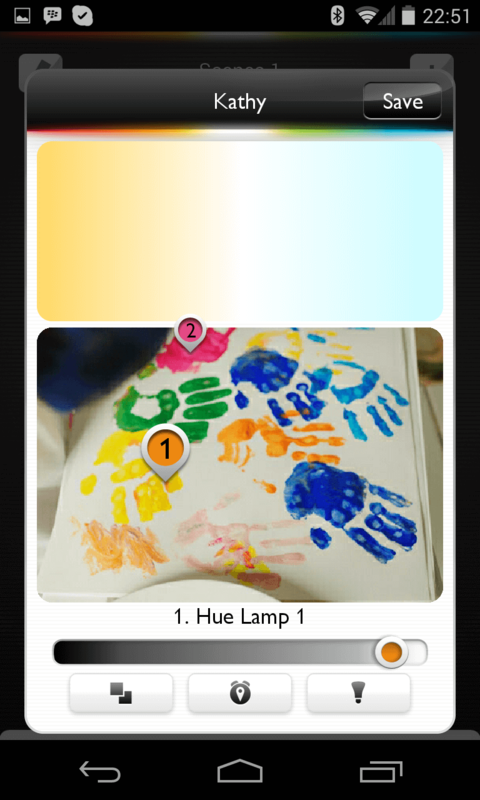 The screenshot below shows that lamp 1 will be orange and lamp 2 will be magenta. It’s all a bit abstract until you see it in action, so here’s a short video of my controlling one lamp using a series of the scenes to run through some colour changes. It was filmed with my smartphone, so don’t expect too much! Remember too, that this is just one light and try to imagine all three lights working together to colour a single room. Philips have opened up Hue to developers and are steadily building an ecosystem around both their products and other apps developed by third parties. If you are already have a Philips TV with Ambilight, Hue can further enhance the experience with additional colour lighting. Light strips and Philip’s Living Colors Bloom can take the lighting effects beyond lights and lamps. There’s a solid community behind Hue with people contributing their own scenes and I’ll be taking a look at some of the 3rd party apps in a follow up post next week, along with a further look at the main Hue app. Philips Hue is available from the Apple Store and the starter kit used here costs a little under £180, which isn’t cheap, but compared with the costs of some of the custom solutions in this space, it’s a bargain. Note that although it’s sold through the Apple Store, it works with both iOS and Android devices. Finally, Philips are running a Facebook competition to come up with inspirational ways of using Hue, if you want to win some Hue goodies. 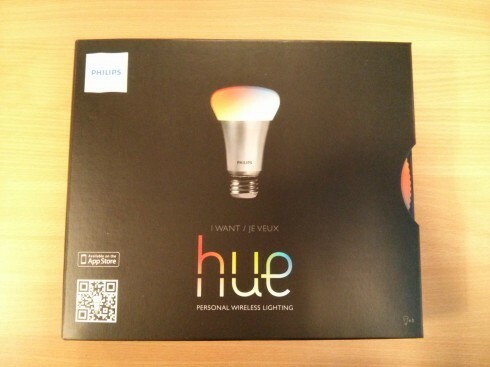 Thanks to Philips for the loan of the Hue starter kit. Yep, we’re going to be doing a follow-up article on IFTTT and Hue soon. I don’t have them myself but I’ve seen people doing crazy stuff with it via IFTTT (https://ifttt.com/hue).